Usually, to create a video in personal way, we will devote ourselves to making extraordinary one. However, if we share it to social platform, how can you prevent the online viewers from using it without permission? That’s right. Just like the forum user said, by watermarking all videos, we can easily maintain our intellectual property rights and protect our private ownership. At this moment, you should have realized the importance of the watermark. Next we are going to show you how to create a watermark based on your own needs. Joyoshare Media Cutter for Windows (or Joyoshare Media Cutter for Mac) is a trustworthy watermark logo maker. It can not only empower you to insert image watermark but also allow you to add text watermark in your own way. Most of all, you can get an access to adjust transparency, size, and location for both of them. To create personalized text watermark, you can also design the font color, shadow color and outline color as per your own preferences. Besides, Joyoshare Media Cutter has option to reset horizontal spacing, vertical spacing, showdown offset, outline size, font style, and writing system and apply strikeout or underline effects for text without hassle. All-around as this outstanding tool is, it as well facilitates you to cut, trim, crop, rotate and join your video files. 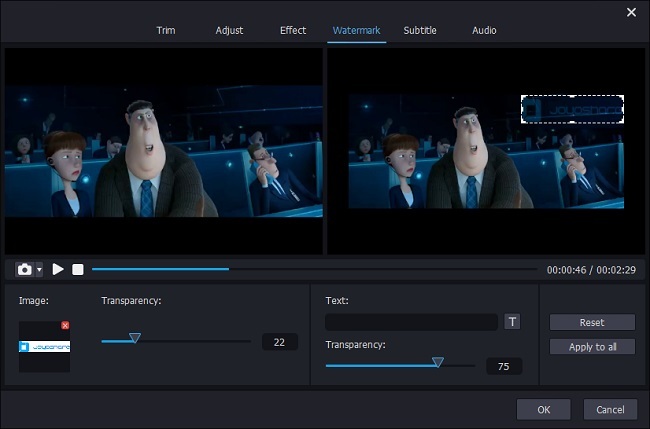 You can take advantage of its powerful video editor to adjust brightness, contrast, saturation, hue, etc., apply video & sound effects, and insert subtitle and more freely. Good news is that any video formats can be supported in this smart program. You can even customize key parameters for your output format and then transfer it to portable device. 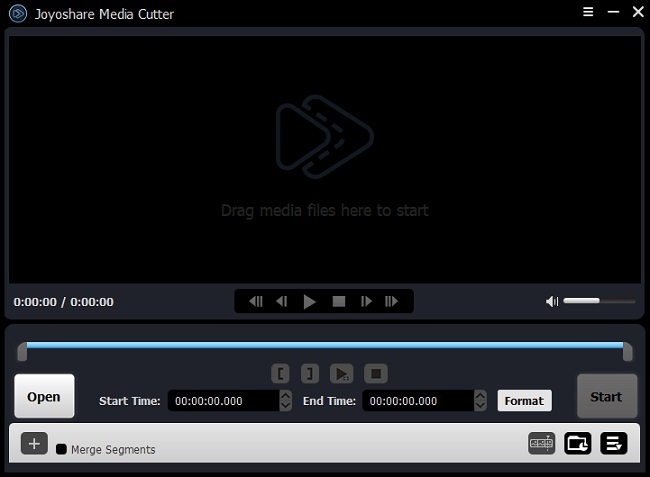 Make Joyoshare Media Cutter run on your Computer. Afterwards, you are allowed to add selected video. Straightly drag and drop the video file to the main interface. Or you can click the "Open" button to search your local hard drive and then get the one you like imported. Note: Joyoshare Media Cutter cannot support batch mode, meaning only one file can be chosen to add each time. If you want to deal with multiple videos in bulk, you can use Joyoshare Video Converter. Hit the "Show segment list" icon at the lower right corner so that you can keep desired sections left by adjusting the temporal interval. Press the "+" button to generate more than one video cuts for yourself if you need. Of course, it's feasible to add watermark to a video as well. Then you can move the yellow handles or fill in the time frames to set exact time points for each video clip. Hereafter, go to click the edit button and enter "Watermark" tab from the top menu bar. Just as the above interface show, you can do a series of designs with your own hands. 1) Add image watermark: click the "+" to browser your own local folder and opt for one required image. You can add special picture with remarkable logo. 2) Insert text watermark: directly enter any text you want in corresponding frame. 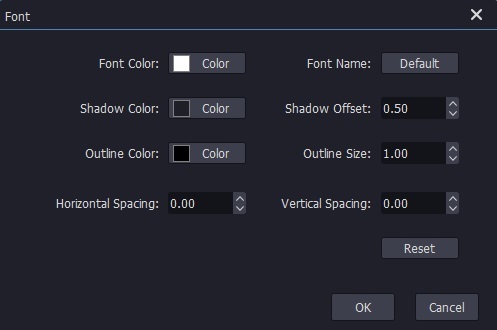 You can hit the icon to set font, including color, size, style and more as following interface present. 3) Slide the controller from the end of left to the end of right to adjust the transparency value. 4) Press "Apply to all" icon to apply the customized watermark to all existing video cuts. Note that any changes done can be seen in the preview window. The final step to make a watermark is to save it on your computer's hard drive. 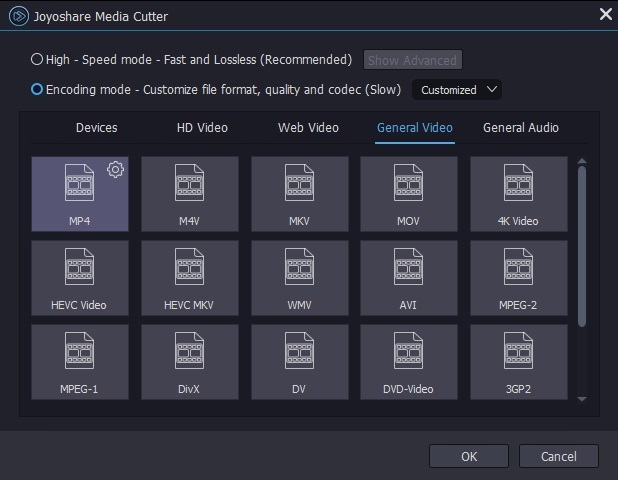 Luckily, almost all widely-used general video, HD video and web video formats are supported in Joyoshare Media Cutter. You can also transfer it to any portable device you have, like iPhone, iPad, Samsung, PSP, Xbox 360, Sony TV, Motorola Droid, etc. Under the encoding mode, you can also make customized output format, resetting resolution, codec, bit rate, sample rate, etc. Once everything is prepared, you can click the "Start" button to export your edited video. 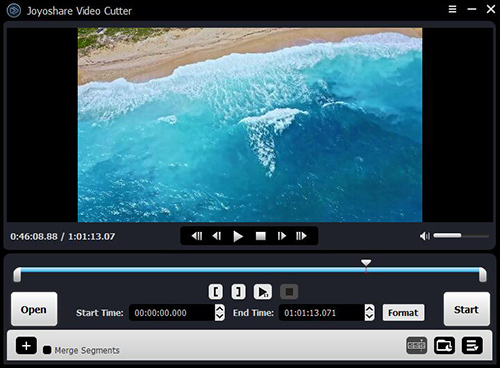 You can also refer to the following video tutorial to see how to apply Joyoshare Media Cutter to cut and edit designated video with customized watermark in high quality.